"Deathly Hallows" redirects here. For other uses, see Deathly Hallows (disambiguation). For the films based on the novel, see Harry Potter and the Deathly Hallows – Part 1 and Harry Potter and the Deathly Hallows – Part 2. Deathly Hallows shattered sales records upon release, surpassing marks set by previous titles of the Harry Potter series. It holds the Guinness World Record for most novels sold within 24 hours of release, with 8.3 million sold in the US alone and 2.65 million in the UK. Generally well received by critics, the book won the 2008 Colorado Blue Spruce Book Award, and the American Library Association named it a "Best Book for Young Adults". A film adaptation of the novel was released in two parts: Harry Potter and the Deathly Hallows – Part 1 in November 2010, and Part 2 in July 2011. Throughout the six previous novels in the series, the main character Harry Potter has struggled with the difficulties of adolescence along with being famous as the only wizard to survive the Killing Curse, Avada Kedavra. The curse was cast by the evil Tom Riddle, better known as Lord Voldemort, a powerful evil wizard, who had murdered Harry's parents and attempted to kill Harry as a baby, in the belief this would frustrate a prophecy that Harry would become his equal. As an orphan, Harry was placed in the care of his Muggle (non-magical) relatives Petunia Dursley and Vernon Dursley. In The Philosopher's Stone, Harry re-enters the wizarding world at age 11 and enrolls in Hogwarts School of Witchcraft and Wizardry. He makes friends with fellow students Ron Weasley and Hermione Granger, and is mentored by the school's headmaster, Albus Dumbledore. He also meets Professor Severus Snape, who intensely dislikes and bullies him. Harry fights Voldemort several times while at school, as the wizard tries to regain a physical form. In Goblet of Fire, Harry is mysteriously entered in a dangerous magical competition called the Triwizard Tournament, which he discovers is a trap designed to allow the return of Lord Voldemort to full strength. During Order of the Phoenix, Harry and several of his friends face off against Voldemort's Death Eaters, a group of Dark witches and wizards, and narrowly defeat them. In Half-Blood Prince, Harry learns that Voldemort has divided his soul into several parts, creating "horcruxes" from various unknown objects to contain them; in this way he has ensured his immortality as long as at least one of the horcruxes still exists. Two of these had already been destroyed, one a diary destroyed by Harry in the events of Chamber of Secrets and one a ring destroyed by Dumbledore shortly before the events of Half-Blood Prince. Dumbledore takes Harry along in the attempt to destroy a third horcrux contained in a locket. However, the horcrux had been taken by an unknown wizard, and upon their return Dumbledore is ambushed and disarmed by Draco Malfoy, who cannot bring himself to kill him. Dumbledore is subsequently killed by Snape, who finishes what Malfoy started. Following Albus Dumbledore's death, Voldemort consolidates his support and power, including covert control of the Ministry of Magic, while Harry is about to turn seventeen, losing the protection of his home. The Order of the Phoenix move Harry to a new location before his birthday, but are attacked upon departure. In the ensuing battle, "Mad-Eye" Moody is killed and George Weasley wounded; Voldemort himself arrives to kill Harry, but Harry's wand fends him off of its own accord. Harry, Ron and Hermione make preparations to abandon Hogwarts and hunt down Voldemort's four remaining Horcruxes, but have few clues to work with as to their identities and locations. One is a locket once owned by Hogwarts' co-founder Salazar Slytherin which was stolen by the mysterious "R.A.B. ", one is possibly a cup originally belonging to co-founder Helga Hufflepuff, a third might be connected to co-founder Rowena Ravenclaw, and the fourth might be Nagini, Voldemort's snake familiar. They also inherit strange bequests from among Dumbledore's possessions: a Golden Snitch for Harry, a Deluminator for Ron, and a book of fairy tales for Hermione. The trio attends Bill Weasley's wedding, but during the reception the Ministry of Magic finally falls to Voldemort and the wedding is attacked by Death Eaters. They flee to 12 Grimmauld Place in London, the family home of Sirius Black, that Harry had inherited a year before. Thanks to the house-elf Kreacher they identify R.A.B. as Sirius' deceased brother Regulus and learn that Slytherin's locket was stolen from the house and ultimately seized by Dolores Umbridge of the Ministry of Magic. They infiltrate the Ministry in disguise and take back the locket, but accidentally break the protection of 12 Grimmauld Place during their escape and must go on the run across the countryside. With no way to destroy the locket, they argue frequently under the object's evil influence, culminating in Ron abandoning Harry and Hermione. Harry and Hermione continue the quest, discovering more about Dumbledore's past, including the death of Dumbledore's younger sister and his connection to the dark wizard Gellert Grindelwald. They travel to Godric's Hollow, Harry's birthplace and the place where his parents died, and meet the elderly magical historian Bathilda Bagshot, but she turns out to be Nagini in disguise, awaiting their arrival. The snake attacks Harry and again they barely escape, but Harry's wand is damaged beyond repair. Their luck finally appears to turn in the Forest of Dean. A mysterious silver doe Patronus appears and guides Harry to an icy pond containing the Sword of Hogwarts co-founder Godric Gryffindor, one of the few objects able to destroy Horcruxes. During Harry's attempt to recover the sword, the Horcrux tries to kill him. He is saved by Ron, who appears suddenly, takes the sword and uses it to destroy the locket. Ron had been guided back to them by the Deluminator, indicating that Dumbledore's gifts may be more useful than they thought. Hermione identifies in Dumbledore's book a strange symbol also worn at the wedding by Xenophilius Lovegood. They visit him and are told the symbol represents the mythical Deathly Hallows, three objects from an old fairy tale titled The Tale of the Three Brothers: the Elder Wand, an unbeatable wand; the Resurrection Stone, able to summon the dead; and an infallible Invisibility Cloak. Although Ron and Hermione are skeptical, Harry believes the Hallows are real and could explain the visions of Voldemort he has been having over the past few months. He suspects Voldemort is hunting the Elder Wand, won by Dumbledore after defeating Grindelwald, believing it will allow him to overpower the connection between his own wand and Harry's. Harry believes the Resurrection Stone was inset into the ring horcrux that Dumbledore discovered the previous year, and may be hidden inside the Snitch Dumbledore left for him, but he can't open it. The description of the third Hallow also matches that of his own inherited Invisibility Cloak. Harry's suspicions are confirmed when he has a vision of Voldemort breaking open Dumbledore's tomb and stealing the Elder Wand from within. The trio are captured by Snatchers and taken to Malfoy Manor, where Bellatrix Lestrange tortures Hermione to learn how the three acquired the sword, which she had believed was in her vault at Gringotts. With the help of Dobby the house-elf they escape along with fellow prisoners Luna Lovegood, Mr. Ollivander, Dean Thomas, and the goblin Griphook. During the escape, Peter Pettigrew is strangled by his own silver hand after Harry reminds him of the debt he owes him; Harry overpowers Draco Malfoy and steals his wand; and Dobby is killed by Bellatrix. Bellatrix's anger in interrogating Hermione suggests to Harry some exceptional object is in her vault, and when questioned, Griphook confirms a gold cup is indeed in her vault. With Griphook's help, they break into the vault at Gringotts, retrieve the cup, and escape on a dragon, but in the chaos Griphook steals the Sword of Gryffindor from them. Harry has another vision of Voldemort and sees that he now understands their plan, and intends to make his remaining horcruxes even safer. The vision also confirms the unidentified horcrux is at Hogwarts. They enter the school through an undiscovered secret entrance in the Hog's Head, a bar in Hogsmeade owned by Dumbledore's brother, Aberforth. Harry alerts the teachers Voldemort is planning an assault on the school. Snape, who had been Headmaster under Voldemort's regime, is ousted by the combined efforts of the heads of houses, and the Order of the Phoenix is summoned to help defend the school and buy time for Harry to locate the horcrux. Voldemort had set a guard in the Ravenclaw tower, corroborating Harry's belief the horcrux is Rowena Ravenclaw's diadem, lost centuries ago. The Ravenclaw ghost's story further confirms this belief, and Harry remembers an old diadem in the Room of Requirement. Ron and Hermione destroy the cup with basilisk fangs taken from the Chamber of Secrets as Voldemort and his army besiege the castle. They find the diadem but are ambushed by Draco Malfoy and his friends Crabbe and Goyle. Crabbe tries to kill them using Fiendfyre, a cursed fire, but is unable to control it; the fire destroys the diadem and himself while Harry and his friends save Malfoy and Goyle. Meanwhile, several major characters are killed in the Battle of Hogwarts, including Remus Lupin, Nymphadora Tonks, and Fred Weasley. In his encampment, Voldemort feels the Elder Wand is not performing as he expected. According to legend, its full allegiance must be won by killing the previous owner, and Voldemort reasons that as Snape killed Dumbledore, he will not be able to fully wield the wand's power until he kills Snape, which he does. Harry arrives as Snape is dying, and Snape passes him memories to view in a pensieve. They reveal Snape had a lifelong love for Harry's mother and felt haunted for causing her death, and despite hating Harry's father he agreed at Dumbledore's request to watch over Harry and act as a double agent against Voldemort. The doe Patronus that led Harry to the Sword was summoned by Snape, who was watching over them the whole time. It is revealed that Dumbledore was slowly dying after mishandling the ring horcrux, and he planned his "murder" with Snape in advance to prove Snape's allegiance to Voldemort. The memories also explain that Harry himself is a horcrux and must die at Voldemort's hand if Voldemort is to become mortal. Harry accepts his death and goes to the Forbidden Forest to allow Voldemort to kill him. On the way he mentions to Neville Longbottom that Voldemort's snake Nagini must be killed to make Voldemort vulnerable. He finally manages to open the Snitch and uses the Resurrection Stone within to seek comfort and courage from his dead loved ones—his parents, Sirius Black, and Lupin—dropping the Stone in the forest before reaching Voldemort's camp. Voldemort uses the Killing Curse and Harry does not defend himself. Harry awakens in a dreamlike location resembling Kings Cross station and is greeted by Dumbledore, who explains that Voldemort's original Killing Curse left a fragment of Voldemort's soul in Harry, which caused the connection they had felt, making Harry an unintended Horcrux; this fragment had just been destroyed by Voldemort himself. When Voldemort used Harry's blood to regain his full strength, this further protected Harry from Voldemort, allowing Harry to return to life if he chooses, or to "go on". Harry chooses to return and feigns death. Narcissa Malfoy feels Harry's pulse and lies to Voldemort by stating he is dead after learning that Draco is still alive. Voldemort calls a truce and displays Harry's body, offering to spare most of the defenders if they surrender. Neville, however, pulls the Sword of Gryffindor out of the Sorting Hat and uses it to behead Nagini, leaving Voldemort unprotected, and Harry escapes under his cloak as the battle resumes. In a final onslaught, Bellatrix is killed by Molly Weasley and Harry reveals to Voldemort that he is alive. He explains to Voldemort the Elder Wand's loyalty transfers upon the defeat, not necessarily the killing, of its previous master. Although Voldemort believes by killing Snape he has gained the Wand's loyalty, Snape was in fact never its master. Instead, Draco Malfoy inadvertently earned the Wand's loyalty when he disarmed Dumbledore just before Snape arrived to kill him. Therefore, Harry believes that their duel will depend on whether or not the Wand recognises Harry to be its new master after he disarmed Draco at Malfoy Manor weeks prior. Voldemort attempts one final Killing Curse on Harry, but the Elder Wand refuses to act against Harry and the spell rebounds, striking Voldemort and destroying him once and for all. Harry uses the Elder Wand to repair his original wand, planning to return the Elder Wand to Dumbledore's tomb where its power may vanish if Harry dies undefeated and it can drop out of history. Harry does not intend to search for the Resurrection Stone he dropped in the Forbidden Forest, but will keep the Invisibility Cloak he inherited. The wizarding world returns to peace once more. In an epilogue set in King's Cross station 19 years later, the primary characters are seeing their own children off to Hogwarts. Harry and Ginny are a couple with three children: James Sirius, Albus Severus, and Lily Luna. Ron and Hermione also have two children, Rose and Hugo. Harry's godson Teddy Lupin is found kissing Bill Weasley and Fleur Delacour's daughter Victoire; Neville Longbottom is now a Hogwarts professor; Draco Malfoy and his wife are also at the station to send off their son, Scorpius. Albus is departing for his first year at Hogwarts and is worried he will be placed into Slytherin House. Harry reassures him by telling his son he is named after two Hogwarts headmasters, one of them (Snape) a Slytherin and "the bravest man he had ever met", but the Sorting Hat could also take account of personal preferences, as it did for Harry. The book ends with the words: "The scar had not pained Harry for nineteen years. All was well." Harry Potter and the Philosopher's Stone was published by Bloomsbury, the publisher of all Harry Potter books in the United Kingdom, on 30 June 1997. It was released in the United States on 1 September 1998 by Scholastic—the American publisher of the books—as Harry Potter and the Sorcerer's Stone, after Rowling had received US$105,000 for the American rights—an unprecedented amount for a children's book by a then-unknown author. The second book, Harry Potter and the Chamber of Secrets was originally published in the UK on 2 July 1998, and in the US on 2 June 1999. Harry Potter and the Prisoner of Azkaban was then published a year later in the UK on 8 July 1999, and in the US on 8 September 1999. Harry Potter and the Goblet of Fire was published on 8 July 2000 at the same time by Bloomsbury and Scholastic. Harry Potter and the Order of the Phoenix is the longest book in the series at 766 pages in the UK version and 870 pages in the US version. It was published worldwide in English on 21 June 2003. Harry Potter and the Half-Blood Prince was published on 16 July 2005, and it sold 9 million copies in the first 24 hours of its worldwide release. The title of the book refers to three mythical objects featured in the story, collectively known as the "Deathly Hallows"—an unbeatable wand, a stone to bring the dead to life, and a cloak of invisibility. Shortly before releasing the title, J. K. Rowling announced that she had considered three titles for the book. The final title was released to the public on 21 December 2006, via a special Christmas-themed hangman puzzle on Rowling's website, confirmed shortly afterwards by the book's publishers. When asked during a live chat about the other titles she had been considering, Rowling mentioned Harry Potter and the Elder Wand and Harry Potter and the Peverell Quest. Rowling completed the final chapters of Deathly Hallows in Room 552 of the Balmoral Hotel. Rowling completed the book while staying at the Balmoral Hotel in Edinburgh in January 2007, and left a signed statement on a marble bust of Hermes in her room which read: "J. K. Rowling finished writing Harry Potter and the Deathly Hallows in this room (552) on 11 January 2007". In a statement on her website, she said, "I've never felt such a mixture of extreme emotions in my life, never dreamed I could feel simultaneously heartbroken and euphoric." She compared her mixed feelings to those expressed by Charles Dickens in the preface of the 1850 edition of David Copperfield, "a two-years' imaginative task". "To which," she added, "I can only sigh, try seventeen years, Charles". She ended her message by saying "Deathly Hallows is my favourite, and that is the most wonderful way to finish the series". When asked before publication about the forthcoming book, Rowling stated that she could not change the ending even if she wanted. "These books have been plotted for such a long time, and for six books now, that they're all leading a certain direction. So, I really can't". She also commented that the final volume related closely to the previous book in the series, Harry Potter and the Half-Blood Prince, "almost as though they are two-halves of the same novel". She has said that the last chapter of the book was written "in something like 1990", as part of her earliest work on the series. Rowling also revealed she originally wrote the last words to be "something like: 'Only those who he loved could see his lightning scar'". Rowling changed this because she did not want people to think Voldemort would rise again and to say that Harry's mission was over. J. K. Rowling has said that the main theme of the series is Harry dealing with death. The Harry Potter series has been criticised for supposedly supporting witchcraft and the occult. Before publication of Deathly Hallows, Rowling refused to speak out about her religion, stating, "If I talk too freely, every reader, whether 10 or 60, will be able to guess what's coming in the books". However, many have noted Christian allegories apparent in Deathly Hallows. For example, Harry dies and then comes back to life to save mankind, like Christ. The location where this occurs is King's Cross. Harry also urges Voldemort to show remorse, to restore his shattered soul. Rowling also stated that "my belief and my struggling with religious belief ... I think is quite apparent in this book", which is shown as Harry struggles with his faith in Dumbledore. The Philosopher's Stone as pictured in Michael Maier's 1617 alchemical work Atalanta Fugiens, similar to the presentation of the Deathly Hallows and Resurrection Stone. Deathly Hallows begins with a pair of epigraphs, one by Quaker leader William Penn and one from Aeschylus' The Libation Bearers. Of this, Rowling said "I really enjoyed choosing those two quotations because one is pagan, of course, and one is from a Christian tradition. I'd known it was going to be those two passages since Chamber was published. I always knew [that] if I could use them at the beginning of book seven then I'd cued up the ending perfectly. If they were relevant, then I went where I needed to go. They just say it all to me, they really do". When Harry visits his parents' grave, the biblical reference "The last enemy that shall be destroyed is death" (1 Corinthians 15:26) is inscribed on the grave. The Dumbledores' family tomb also holds a biblical quote: "Where your treasure is, there your heart will be also", which is from Matthew 6:21. Rowling states, "They're very British books, so on a very practical note Harry was going to find biblical quotations on tombstones ... [but] I think those two particular quotations he finds on the tombstones at Godric's Hollow, they sum up – they almost epitomise the whole series". Harry Potter pundit John Granger additionally noted that one of the reasons the Harry Potter books were so popular is their use of literary alchemy (similar to Romeo and Juliet, C. S. Lewis's Perelandra and Charles Dickens's A Tale of Two Cities) and vision symbolism. In this model, authors weave allegorical tales along the alchemical magnum opus. Since the medieval period, alchemical allegory has mirrored the passion, death and resurrection of Christ. While the entire series utilises symbols common in alchemy, the Deathly Hallows completes this cycle, tying themes of death, rebirth, and the Resurrection Stone to the principal motif of alchemical allegory, and topics presented in the first book of the series. The launch was celebrated by an all-night book signing and reading at the Natural History Museum in London, which Rowling attended along with 1,700 guests chosen by ballot. Rowling toured the US in October 2007, where another event was held at Carnegie Hall in New York City with tickets allocated by sweepstake. J. K. Rowling arranged with her publishers for a poster bearing the face of the missing British child Madeleine McCann to be made available to book sellers when Deathly Hallows was launched on 21 July 2007, and said that she hoped that the posters would be displayed prominently in shops all over the world. 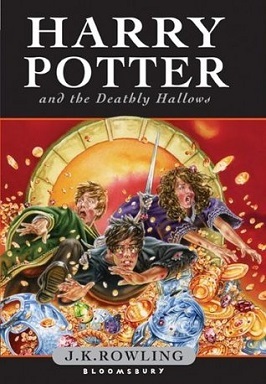 After it was told that the novel would be released on 21 July 2007, Warner Bros. shortly thereafter said that the film adaptation of Harry Potter and the Order of the Phoenix would be released shortly before the novel would be released, on 13 July 2007, making many people proclaim that July 2007, was the month of Harry Potter. Bloomsbury invested £10 million in an attempt to keep the book's contents secure until 21 July, the release date. Arthur Levine, US editor of the Harry Potter series, denied distributing any copies of Deathly Hallows in advance for press review, but two US papers published early reviews anyway. There was speculation that some shops would break the embargo and distribute copies of the book early, as the penalty imposed for previous instalments—that the distributor would not be supplied with any further copies of the series—would no longer be a deterrent. In the week before its release, a number of texts purporting to be genuine leaks appeared in various forms. On 16 July, a set of photographs representing all 759 pages of the US edition was leaked and was fully transcribed prior to the official release date. The photographs later appeared on websites and peer-to-peer networks, leading Scholastic to seek a subpoena in order to identify one source. This represented the most serious security breach in the Harry Potter series' history. Rowling and her lawyer confirmed that there were genuine online leaks. Reviews published in both The Baltimore Sun and The New York Times on 18 July 2007, corroborated many of the plot elements from this leak, and about one day prior to release, The New York Times confirmed that the main circulating leak was real. Scholastic announced that approximately one-ten-thousandth (0.0001) of the US supply had been shipped early — interpreted to mean about 1,200 copies. One reader in Maryland received a copy of the book in the mail from DeepDiscount.com four days before it was launched, which evoked incredulous responses from both Scholastic and DeepDiscount. Scholastic initially reported that they were satisfied it had been a "human error" and would not discuss possible penalties; however, the following day Scholastic announced that it would be launching legal action against DeepDiscount.com and its distributor, Levy Home Entertainment. Scholastic filed for damages in Chicago's Circuit Court of Cook County, claiming that DeepDiscount engaged in a "complete and flagrant violation of the agreements that they knew were part of the carefully constructed release of this eagerly awaited book." Some of the early release books soon appeared on eBay, in one case being sold to Publishers Weekly for US$250 from an initial price of US$18. Asda, along with several other UK supermarkets, having already taken pre-orders for the book at a heavily discounted price, sparked a price war two days before the book's launch by announcing they would sell it for just £5 a copy. Other retail chains then also offered the book at discounted prices. At these prices the book became a loss leader. This caused uproar from traditional UK booksellers who argued they had no hope of competing in those conditions. Independent shops protested loudest, but even Waterstone's, the UK's largest dedicated chain bookstore, could not compete with the supermarket price. Some small bookstores hit back by buying their stock from the supermarkets rather than their wholesalers. Asda attempted to counter this by imposing a limit of two copies per customer to prevent bulk purchases. Philip Wicks, a spokesman for the UK Booksellers Association, said, "It is a war we can't even participate in. We think it's a crying shame that the supermarkets have decided to treat it as a loss-leader, like a can of baked beans." Michael Norris, an analyst at Simba Information, said: "You are not only lowering the price of the book. At this point, you are lowering the value of reading." In Malaysia, a similar price war caused controversy regarding sales of the book. Four of the biggest bookstore chains in Malaysia, MPH Bookstores, Popular Bookstores, Times and Harris, decided to pull Harry Potter and the Deathly Hallows off their shelves as a protest against Tesco and Carrefour hypermarkets. The retail price of the book in Malaysia is MYR 109.90, while the hypermarkets Tesco and Carrefour sold the book at MYR 69.90. The move by the bookstores was seen as an attempt to pressure the distributor Penguin Books to remove the books from the hypermarkets. 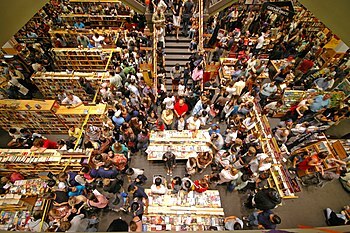 However, as of 24 July 2007, the price war has ended, with the four bookstores involved resuming selling the books in their stores with discount. Penguin Books has also confirmed that Tesco and Carrefour are selling the book at a loss, urging them to practice good business sense and fair trade. The book's early Saturday morning release in Israel was criticised for violating Shabbat. Trade and Industry Minister Eli Yishai commented "It is forbidden, according to Jewish values and Jewish culture, that a thing like this should take place at 2 am on Saturday. Let them do it on another day." Yishai indicated that he would issue indictments and fines based on the Hours of Work and Rest Law. The Baltimore Sun's critic, Mary Carole McCauley, noted that the book was more serious than the previous novels in the series and had more straightforward prose. Furthermore, reviewer Alice Fordham from The Times wrote that "Rowling's genius is not just her total realisation of a fantasy world, but the quieter skill of creating characters that bounce off the page, real and flawed and brave and lovable". Fordham concluded, "We have been a long way together, and neither Rowling nor Harry let us down in the end". The New York Times writer Michiko Kakutani agreed, praising Rowling's ability to make Harry both a hero and a character that can be related to. Time magazine's Lev Grossman named it one of the Top 10 Fiction Books of 2007, ranking it at No. 8, and praised Rowling for proving that books can still be a global mass medium. Novelist Elizabeth Hand criticised that "... the spectacularly complex interplay of narrative and character often reads as though an entire trilogy's worth of summing-up has been crammed into one volume." In a starred review from Kirkus Reviews, the reviewer said, "Rowling has shown uncommon skill in playing them with and against each other, and also woven them into a darn good bildungsroman, populated by memorable characters and infused with a saving, irrepressible sense of fun". They also praised the second half of the novel, but criticised the epilogue, calling it "provocatively sketchy". In another review from The Times, reviewer Amanda Craig said that while Rowling was "not an original, high-concept author", she was "right up there with other greats of children's fiction". Craig went on to say that the novel was "beautifully judged, and a triumphant return to form", and that Rowling's imagination changed the perception of an entire generation, which "is more than all but a handful of living authors, in any genre, have achieved in the past half-century". In contrast, Jenny Sawyer of The Christian Science Monitor said that, "There is much to love about the Harry Potter series, from its brilliantly realised magical world to its multilayered narrative", however, "A story is about someone who changes. And, puberty aside, Harry doesn't change much. As envisioned by Rowling, he walks the path of good so unwaveringly that his final victory over Voldemort feels, not just inevitable, but hollow". In The New York Times, Christopher Hitchens compared the series to World War Two-era English boarding school stories, and while he wrote that "Rowling has won imperishable renown" for the series as a whole, he also stated that he disliked Rowling's use of deus ex machina, that the mid-book camping chapters are "abysmally long", and Voldemort "becomes more tiresome than an Ian Fleming villain". Catherine Bennett of The Guardian praised Rowling for putting small details from the previous books and making them large in Deathly Hallows, such as Grindelwald being mentioned on a Chocolate Frog Card in the first book. While she points out "as her critics say, Rowling is no Dickens", she says that Rowling "has willed into a fictional being, in every book, legions of new characters, places, spells, rules and scores of unimagined twists and subplots". Stephen King criticised the reactions of some reviewers to the books, including McCauley, for jumping too quickly to surface conclusions of the work. He felt this was inevitable, because of the extreme secrecy before launch which did not allow reviewers time to read and consider the book, but meant that many early reviews lacked depth. Rather than finding the writing style disappointing, he felt it had matured and improved. He acknowledged that the subject matter of the books had become more adult, and that Rowling had clearly been writing with the adult audience firmly in mind since the middle of the series. He compared the works in this respect to Huckleberry Finn and Alice in Wonderland which achieved success and have become established classics, in part by appealing to the adult audience as well as children. Sales for Harry Potter and the Deathly Hallows were record setting. The initial US print run for Deathly Hallows was 12 million copies, and more than a million were pre-ordered through Amazon.com and Barnes & Noble, 500 percent higher than pre-sales had been for Half-Blood Prince. On 12 April 2007, Barnes & Noble declared that Deathly Hallows had broken its pre-order record, with more than 500,000 copies pre-ordered through its site. On opening day, a record 8.3 million copies were sold in the United States (over 96 per second), and 2.65 million copies in the United Kingdom. It holds the Guinness World record for fastest selling book of fiction in 24 hours for US sales. At WH Smith, sales reportedly reached a rate of 15 books sold per second. By June 2008, nearly a year after it was published, worldwide sales were reportedly around 44 million. Harry Potter and the Deathly Hallows has won several awards. In 2007, the book was named one of The New York Times 100 Notable Books, and one of its Notable Children's Books. The novel was named the best book of 2007, by Newsweek's critic Malcolm Jones. Publishers Weekly also listed Harry Potter and the Deathly Hallows among their Best Books of 2007. In 2008, the American Library Association named the novel one of its Best Books for Young Adults, and also listed it as a Notable Children's Book. Furthermore, Harry Potter and the Deathly Hallows received the 2008 Colorado Blue Spruce Book Award. Due to its worldwide fame, Harry Potter and the Deathly Hallows has been translated into many languages. The first translation to be released was the Ukrainian translation, on 25 September 2007 (as Гаррі Поттер і смертельні реліквії – Harry Potter i smertel'ni relikviji). The Swedish title of the book was revealed by Rowling as Harry Potter and the Relics of Death (Harry Potter och Dödsrelikerna), following a pre-release question from the Swedish publisher about the difficulty of translating the two words "Deathly Hallows" without having read the book. This is also the title used for the French translation (Harry Potter et les reliques de la mort), the Spanish translation (Harry Potter y las Reliquias de la Muerte), the Dutch translation (Harry Potter en de Relieken van de Dood) and the Brazilian Portuguese translation (Harry Potter e as Relíquias da Morte). The first Polish translation was released with a new title: Harry Potter i Insygnia Śmierci – Harry Potter and the Insignia of Death. The Hindi translation Harry Potter aur Maut ke Tohfe (हैरी पॉटर और मौत के तोहफे), which means "Harry Potter and the Gifts of Death", was released by Manjul Publication in India on 27 June 2008. The Romanian version was released on 1 December 2007 using the title (Harry Potter și Talismanele Morții). Harry Potter and the Deathly Hallows was released in hardcover on 21 July 2007 and in paperback in the United Kingdom on 10 July 2008 and the United States on 7 July 2009. In SoHo, New York, there was a release party for the American paperback edition, with many games and activities. An "Adult Edition" with a different cover illustration was released by Bloomsbury on 21 July 2007. To be released simultaneously with the original US hardcover on 21 July with only 100,000 copies was a Scholastic deluxe edition, highlighting a new cover illustration by Mary GrandPré. In October 2010, Bloomsbury released a "Celebratory" paperback edition, which featured a foiled and starred cover. Lastly, on 1 November 2010, a "Signature" edition of the novel was released in paperback by Bloomsbury. A two-part film adaptation of Harry Potter and the Deathly Hallows is directed by David Yates, written by Steve Kloves and produced by David Heyman, David Barron and J. K. Rowling. Part 1 was released on 19 November 2010, and Part 2 on 15 July 2011. Filming began in February 2009, and ended on 12 June 2010. However, the cast confirmed they would reshoot the epilogue scene as they only had two days to shoot the original. Reshoots officially ended around December 2010. [note 1] Part 1 ended at Chapter 24 of the book, when Voldemort regained the Elder Wand. However, there were a few omissions, such as the appearances of Dean Thomas and Viktor Krum, and Peter Pettigrew's death. James Bernadelli of Reelviews said that the script stuck closest to the text since Harry Potter and the Chamber of Secrets, yet this was met with negativity from some audiences as the film inherited "the book's own problems". Harry Potter and the Deathly Hallows was released simultaneously on 21 July 2007, in both the UK and the United States. The UK edition features the voice of Stephen Fry and runs about 24 hours while the US edition features the voice of Jim Dale and runs about 21 hours. Both Fry and Dale recorded 146 different and distinguishable character voices, and was the most recorded by an individual on an audiobook at the time. For his work on Deathly Hallows, Dale won the 2008 Grammy Award for the Best Spoken Word Album for Children. He also was awarded an Earphone Award by AudioFile, who claimed, "Dale has raised the bar on audiobook interpretation so high it's hard to imagine any narrator vaulting over it." Two action-adventure video games were produced by Electronic Arts to coincide with the release of the film adaptations, as with each of the previous Harry Potter films. Part 1 was released on 16 November 2010, and Part 2 on 12 July 2011. Both games received a mixed to negative reaction from critics. On 4 December 2008, Rowling released The Tales of Beedle the Bard both in the UK and US. The Tales of Beedle the Bard is a spin-off of Deathly Hallows and contains fairy tales that are told to children in the "Wizarding World". The book includes five short stories, including "The Tale of the Three Brothers" which is the story of the Deathly Hallows. Amazon.com released an exclusive collector's edition of the book which is a replica of the book that Amazon.com purchased at auction in December 2007. Seven copies were auctioned off in London by Sotheby's. Each was illustrated and handwritten by Rowling and is 157 pages. It was bound in brown Moroccan leather and embellished with five hand-chased hallmarked sterling silver ornaments and mounted moonstones. ^ While this is not officially confirmed, Emma Watson is quoted as saying "We have reshoots at Christmas", so filming presumably ended around this time. ^ "Record First-Day Sales for Last 'Harry Potter' Book". The New York Times. 22 July 2007. Archived from the original on 16 December 2017. Retrieved 15 December 2017. ^ a b "Fastest selling book of fiction in 24 hours". Guinness Book of World Records. 21 July 2007. Archived from the original on 19 September 2011. Retrieved 5 February 2011. ^ Rowling (2005), et al. p. 503. ^ "The Potter phenomenon". BBC News. 18 February 2003. Archived from the original on 23 November 2008. Retrieved 27 September 2008. ^ "Wild about Harry". New York Post. 2 July 2007. Archived from the original on 17 May 2008. Retrieved 27 September 2008. ^ "Speed-reading after lights out". The Guardian. UK. 19 July 2000. Archived from the original on 31 December 2013. Retrieved 27 September 2008. ^ Cassy, John (16 January 2003). "Harry Potter and the hottest day of summer". The Guardian. UK. Archived from the original on 31 December 2013. Retrieved 27 September 2008. ^ "July date for Harry Potter book". BBC News. 21 December 2004. Archived from the original on 5 July 2009. Retrieved 27 September 2008. ^ "Harry Potter finale sales hit 11m". BBC News. 23 July 2007. Archived from the original on 28 November 2008. Retrieved 21 August 2008. ^ a b "Webchat with J.K. Rowling, 30 July 2007". Bloomsbury Publishing. Archived from the original on 6 January 2008. Retrieved 31 July 2007. ^ "Book 7 Update". J.K.Rowling Official Site. Archived from the original on 15 April 2007. Retrieved 23 April 2007. ^ "Harry Potter and the Deathly Hallows". Bloomsbury Publishing. 21 December 2006. Archived from the original on 3 February 2007. Retrieved 21 December 2006. ^ "Harry Potter fans pay £1,000 a night to stay in hotel room where JK Rowling finished series". UK. 20 July 2008. Archived from the original on 20 February 2016. Retrieved 10 February 2016. ^ "Rowling reacts to Potter's end". USA Today. Associated Press. 6 February 2007. Archived from the original on 23 August 2007. Retrieved 21 July 2007. ^ "Jones, Owen. One-on-one interview with J.K. Rowling, ITV Network July 17, 2005". ITV. 17 July 2005. Archived from the original on 29 June 2007. Retrieved 16 June 2007. ^ Rowling, J. K. (15 March 2004). "Progress on Book Six". J. K. Rowling Official Site. Archived from the original on 16 December 2006. Retrieved 23 December 2006. ^ a b Vieira, Meredith (30 July 2007). "Harry Potter: The final chapter". MSNBC. Archived from the original on 19 January 2011. Retrieved 6 February 2011. ^ a b Symon, Evan V. (14 January 2013). "10 Deleted Chapters that Transformed Famous Books". listverse.com. Archived from the original on 5 September 2015. ^ a b Geordie Greig (10 January 2006). "'There would be so much to tell her...'". The Daily Telegraph. UK. Archived from the original on 24 April 2009. Retrieved 4 April 2007. ^ a b Grossman, Lev (9 December 2007). "Top 10 Fiction Books: #8. Harry Potter and the Deathly Hallows". Time. Archived from the original on 22 December 2007. Retrieved 24 December 2007. ^ Czubek, TA; Greenwald, J (Fall 2005). "Understanding Harry Potter: Parallels to the Deaf World" (PDF). Journal of Deaf Studies and Deaf Education. 10 (4): 442–50. doi:10.1093/deafed/eni041. PMID 16000691. Archived (PDF) from the original on 8 January 2016. ^ Duffy, Edward (2002). "Sentences in Harry Potter, Students in Future Writing Classes". Rhetoric Review. 21 (2): 170–87. doi:10.1207/S15327981RR2102_03. ^ "JK Rowling outs Dumbledore as gay". BBC News. 20 October 2007. Archived from the original on 22 October 2007. Retrieved 21 October 2007. ^ Barton, Benjamin (2006). "Harry Potter and the Half-Crazed Bureaucracy" (PDF). Michigan Law Review. Archived from the original (PDF) on 10 August 2007. Retrieved 31 July 2007. ^ Miller, Lisa (6 August 2007). "Christ-like". Newsweek. 150 (6): 12. ISSN 0028-9604. Archived from the original on 16 August 2011. ^ Shawn Adler (2007). "'Harry Potter' Author J.K. Rowling Opens Up About Books' Christian Imagery". MTV. Archived from the original on 18 October 2007. Retrieved 26 February 2011. ^ a b c Garcia, Elena (19 October 2007). "Harry Potter author reveals books' Christian allegory, her struggling faith". Christian Today. Retrieved 6 February 2011. ^ Granger, John (2009). Harry Potter's Bookshelf: The Great Books Behind The Hogwarts Adventures. Penguin Group Inc. ISBN 978-1-101-13313-2. ^ "Harry Potter". Scholastic. Archived from the original on 25 May 2007. Retrieved 25 May 2007. ^ "The Open Book Tour, October 2007". J.K.Rowling Official Site. 14 July 2007. Archived from the original on 7 July 2007. Retrieved 14 July 2007. ^ "Scholastic announces record breaking 12 million first printing in United States of Harry Potter and the Deathly Hallows". Scholastic. 14 March 2007. Archived from the original on 23 June 2007. Retrieved 9 July 2007. ^ "Harry Potter: Shrieking Shack Poll". Scholastic. Archived from the original on 14 July 2007. Retrieved 18 August 2007. ^ "Rowling in Madeleine poster plea". BBC News. 16 July 2007. Archived from the original on 7 September 2007. Retrieved 17 July 2007. ^ "10 million pounds to guard 7th Harry Potter book". Rediff News. 16 July 2007. Archived from the original on 1 November 2007. Retrieved 16 July 2007. ^ "Editor Says Deathly Hallows Is Unleakable". MTV Overdrive (video). 17 July 2007. Retrieved 19 July 2007. ^ Savage, Mark (12 July 2007). "Potter embargo "could be broken"". BBC News. Archived from the original on 8 August 2007. Retrieved 17 July 2007. ^ "Harry Potter Fans Transcribe Book from Photos". TorrentFreak. 18 July 2007. Archived from the original on 19 July 2007. Retrieved 19 July 2007. ^ "New Potter book leaked online". The Sydney Morning Herald. 18 July 2007. Archived from the original on 29 August 2007. Retrieved 18 July 2007. ^ "Harry Potter and the Deathly Hallows leaked to BitTorrent". TorrentFreak. 17 July 2007. Archived from the original on 19 July 2007. Retrieved 19 July 2007. ^ Healey, Jon (20 July 2007). "Harry Potter Spoiler Count". Los Angeles Times. Archived from the original on 12 September 2007. Retrieved 20 July 2007. ^ Hoyt, Clark (30 July 2007). "Did the Times Betray Harry Potter Fans?". The New York Times. Archived from the original on 8 August 2007. Retrieved 30 July 2007. ^ a b Fenton, Ben (17 July 2007). "Web abuzz over Potter leak claims". Retrieved 20 July 2007. ^ Malvern, Jack (19 July 2007). "Harry Potter and the great web leak". The Times. London. Archived from the original on 6 July 2008. Retrieved 19 July 2007. ^ Kiehl, Stephen (18 July 2007). "The spell is broken". The Baltimore Sun. Archived from the original on 20 July 2007. Retrieved 18 July 2007. ^ "Press release from Scholastic". PR Newswire (from Scholastic). 18 July 2007. Archived from the original on 29 September 2007. Retrieved 18 July 2007. ^ "Distributor mails final Potter book early". MSNBC. 18 July 2007. Archived from the original on 11 August 2007. Retrieved 18 July 2007. ^ Collier, Will (20 July 2007). "I Was an eBay Voldemort". National Review. Archived from the original on 24 August 2010. Retrieved 20 July 2007. ^ Booth, Jenny; Alberge, Dalya (17 July 2007). "Potter book firm clashes with supermarket over price". The Times. UK. Archived from the original on 6 July 2008. Retrieved 17 July 2009. ^ Addley, Esther (18 July 2007). "Harry Potter and the supermarket giant, a very modern publishing tale". The Guardian. UK. Archived from the original on 27 April 2014. Retrieved 18 July 2009. ^ "British retailer sells final Potter book for $10, setting dangerous precedent for U.S. market". International Herald Tribune. 20 July 2007. Archived from the original on 22 August 2007. Retrieved 17 July 2009. ^ Krishnamoorthy, M.; Kaur, Manjit (21 July 2007). "Harry Potter and the ugly price war". The Star. Archived from the original on 29 April 2014. Retrieved 21 July 2007. ^ Looi, Elizabeth; Goh, Michelle (24 July 2007). "Bookstores end Harry Potter boycott". The Star. Archived from the original on 29 April 2014. Retrieved 24 July 2007. ^ "Plans for Sabbath sales of Harry Potter draw threats of legal action in Israel". International Herald Tribune. 17 July 2007. Archived from the original on 19 September 2007. Retrieved 18 July 2007. ^ Shiri Lev-Ari (17 July 2007). "Yishai warns stores over Harry Potter book launch on Shabbat". Haaretz. Associated Press. Archived from the original on 11 July 2010. Retrieved 18 July 2007. ^ McCauley, Mary Carole (19 July 2007). "An inevitable ending to Harry Potter series". The Baltimore Sun. Archived from the original on 19 August 2007. Retrieved 21 July 2007. ^ Fordham, Alice (21 July 2007). "Harry Potter and the Deathly Hallows". The Times. UK. Archived from the original on 17 May 2011. Retrieved 25 July 2007. ^ Kakutani, Michiko (19 July 2007). "An Epic Showdown as Harry Potter Is Initiated Into Adulthood". The New York Times. Archived from the original on 11 April 2009. Retrieved 20 July 2009. ^ Hand, Elizabeth (22 July 2007). "Harry's Final Fantasy: Last Time's the Charm". The Washington Post. Archived from the original on 30 May 2010. Retrieved 20 July 2009. ^ "Harry Potter and the Deathly Hallows—Editor's Review". Kirkus Reviews. Archived from the original on 11 January 2011. Retrieved 6 February 2011. ^ Craig, Amanda (28 July 2007). "Harry Potter and the Deathly Hallows". The Sunday Times. UK. Retrieved 6 February 2011. ^ Sawyer, Jenny (25 July 2007). "Missing from 'Harry Potter" – a real moral struggle". The Christian Science Monitor. Archived from the original on 27 September 2007. Retrieved 25 July 2007. ^ Hitchens, Christopher (12 August 2007). "The Boy Who Lived". The New York Times. Archived from the original on 16 April 2009. Retrieved 1 April 2008. ^ Bennett, Catherine (28 July 2007). "A send-off fit for a wizard". The Guardian. UK. Archived from the original on 5 October 2014. Retrieved 12 February 2011. ^ a b King, Stephen (17 August 2007). "J K Rowling's Ministry of Magic". Entertainment Weekly (948). Archived from the original on 16 August 2007. Retrieved 21 August 2007. ^ Blais, Jacqueline; Anthony DeBarros (25 July 2007). "'Deathly Hallows' records lively sales". USA Today. Archived from the original on 3 August 2009. Retrieved 13 July 2009. ^ Rich, Motoko (22 July 2007). "Record First-Day Sales for Last 'Harry Potter' Book". The New York Times. Archived from the original on 30 May 2013. Retrieved 13 July 2009. ^ "'Harry Potter and the Deathly Hallows' Breaks Records". Fox News. Associated Press. 24 July 2007. Archived from the original on 7 May 2009. Retrieved 13 July 2009. ^ Phelvin, Patrick (23 July 2007). "Harry Potter and the hallowed sales figures". The Daily Telegraph. London. Archived from the original on 24 July 2009. Retrieved 13 July 2009. ^ a b "Harry Potter and the Deathly Hallows". Arthur A. Levine Books. 2001–2005. Archived from the original on 22 October 2007. Retrieved 17 July 2009. ^ "100 Notable Books of 2007". The New York Times. 2 December 2007. Archived from the original on 11 April 2009. Retrieved 17 July 2009. ^ Fleischman, Paul (2 December 2007). "Notable Children's Books of 2007". The New York Times. Archived from the original on 11 April 2009. Retrieved 17 July 2009. ^ Jones, Malcolm (13 December 2007). "Wizards, Warmongers and the West Coast". Archived from the original on 1 December 2010. Retrieved 5 February 2011. ^ Staff (5 November 2007). "PW's Best Books of the Year". Publishers Weekly. 254 (44). Archived from the original on 24 April 2014. Retrieved 17 July 2009. ^ "Best Books for Young Adults 2008". American Library Association. 2008. Archived from the original on 1 May 2009. Retrieved 17 July 2009. ^ "2008 Notable Children's Books" (Press release). American Library Association. 2008. Archived from the original on 19 February 2010. Retrieved 17 July 2009. ^ Matoshko, Alexandra (27 July 2007). "Ukrainian Potter comes first". Kyiv Post. Archived from the original on 2 April 2015. Retrieved 29 July 2007. ^ "Släppdatum för sjunde Harry Potter-boken klar!" (in Swedish). Tiden. Archived from the original on 4 July 2007. Retrieved 24 July 2007. ^ "Último "Harry Potter" tem título definido no Brasil". Folha de S. Paulo (in Portuguese). 28 May 2007. Retrieved 15 December 2010. ^ "Harry Potter i insygnia śmierci". LibraryThing. 24 December 2007. Retrieved 24 December 2007. ^ "Harry Potter aur Maut Ke Tohfe – Hindi Version of the Deathly Hallows". India Club. Archived from the original on 3 July 2009. Retrieved 4 August 2009. ^ Graeber, Laurel (2 July 2009). "Spare Times – For Children". The New York Times. Archived from the original on 23 August 2017. Retrieved 12 February 2011. ^ "Clues revealed in special edition Harry Potter cover". MSN allDay. 8 July 2007. Archived from the original on 17 July 2011. Retrieved 3 March 2011. ^ "Harry Potter and the Deathly Hallows Celebratory Edition". Bloomsbury. Archived from the original on 17 October 2010. Retrieved 12 February 2011. ^ Allen, Katie (30 March 2010). "Bloomsbury repackages Harry Potter". TheBookseller.com. Archived from the original on 18 September 2012. Retrieved 25 March 2011. ^ "Official: Two Parts for Deathly Hallows Movie". ComingSoon.net. 25 February 2009. Archived from the original on 12 December 2010. Retrieved 2 March 2009. ^ "Release Date Set for Harry Potter 7: Part I". ComingSoon.net. 25 April 2008. Archived from the original on 18 May 2008. Retrieved 25 May 2008. ^ Schwartz, Alison (14 June 2010). "Daniel Radcliffe Calls Wrapping Up Harry Potter Devastating". People. Archived from the original on 8 February 2011. Retrieved 22 January 2011. ^ Magrath, Andrea (9 December 2010). "Better get to the wig store! Emma Watson and Harry Potter co-stars to re-shoot crucial final Deathly Hallows scenes". Daily Mail. UK. Archived from the original on 13 September 2012. Retrieved 12 February 2011. ^ Liam (13 November 2010). "Deathly Hallows epilogue scenes to be reshot over Christmas". Filmonic.com. Archived from the original on 16 August 2011. Retrieved 17 August 2011. ^ Gallagher, Brian (13 August 2010). "Harry Potter and the Deathly Hallows Movie Split Revealed". MovieWeb. Archived from the original on 28 September 2012. Retrieved 12 February 2011. ^ Staskiewicz, Kieth; Franich, Darren; Vary, Adam B. "'Harry Potter and the Deathly Hallows—Part 1': What's Changed?". Entertainment Weekly. Archived from the original on 6 July 2011. Retrieved 12 February 2011. ^ Bernadelli, James (17 November 2010). "Harry Potter and the Deathly Hallows I". Reelviews.net. Archived from the original on 24 July 2011. Retrieved 13 February 2011. ^ Reynolds, Simon (23 August 2010). "'Deathly Hallows' screens to rave reviews". Digital Spy. Archived from the original on 27 December 2010. Retrieved 2 March 2011. ^ "Harry Potter and the Deathly Hallows published by Bloomsbury and HNP as an unabridged audiobook to be published simultaneously with the book for the first time on July 21st 2007". Bloomsbury. Archived from the original on 29 June 2007. Retrieved 17 February 2011. ^ "Harry Potter and the Deathly Hallows". Simply Audiobooks. Archived from the original on 16 July 2011. Retrieved 17 February 2011. ^ Glenday, Craig, ed. (2008). Guinness World Records 2009. Guinness World Records. ISBN 1-904994-37-7. ^ Gans, Andrew; Ku, Andrew (10 February 2008). "Spring Awakening Wins 2008 Best Musical Show Album Grammy; Krieger and Dale Also Win". Playbill. Archived from the original on 29 June 2011. Retrieved 17 February 2011. ^ "AudioFile review: Harry Potter and the Deathly Hallows". AudioFile. October – November 2007. Archived from the original on 28 December 2010. Retrieved 17 February 2011. ^ "Harry Potter and the Deathly Hallows, Part 1 for PC Reviews". Metacritic. Retrieved 17 October 2018. ^ "Harry Potter and the Deathly Hallows, Part 2 Critic Reviews for PC". Metacritic. Retrieved 17 October 2018. The Tales of Beedle the Bard, Standard Edition (Harry Potter) (9780545128285): J.K. Rowling: Books. Amazon.com. ISBN 0545128285. The Tales of Beedle the Bard, Standard Edition: Amazon.co.uk: J.K. Rowling: Books. Amazon.co.uk. ASIN 0747599874. ^ "The Fairy Tales of J.K. Rowling". Amazon.com. Archived from the original on 14 June 2012. Retrieved 23 April 2012. Granger, John. The Deathly Hallows Lectures: The Hogwarts Professor Explains the Final Harry Potter Adventure. Zossima Press: 2008. ISBN 0-9723221-7-5. Hall, Susan. Reading Harry Potter: critical essays. Greenwood Publishing: 2003. ISBN 0-313-32067-5. Rowling, JK. Harry Potter and the Half-Blood Prince. London: Bloomsbury/New York City: Scholastic: 2005. UK ISBN 0-747-58108-8/US ISBN 0-439-78454-9. Rowling, JK. Harry Potter and the Goblet of Fire. London: Bloomsbury/New York City: Scholastic: 2000. UK ISBN 0-747-54624-X/US ISBN 0-439-13959-7. Shapiro, Marc. J. K. Rowling: The Wizard Behind Harry Potter. St. Martin's Press: 2007. ISBN 0-312-37697-9. Heckl, Raik. "The Tale of the Three Brothers" and the Idea of the Speaking Dead in the Harry Potter Novels. Leipzig: 2008. Wikimedia Commons has media related to Harry Potter and the Deathly Hallows.